Over at Steve Dombek’s Narrow Streets SF website, he proposes undoing America’s 20th century mistake of building ultra-wide streets here in San Francisco. Instead, the land would be sold off to build new housing, and we’d be left with traditional (or “narrow”) streets like you find in the rest of the world. Naturally, this idea caught some buzz in the press given SF’s current housing shortages. Seems like a nice plan, right? You get rid of the (largely wasted) space and put in new housing and retail. But here’s the thing: where will all the money go from selling the land and the subsequent property tax? Well, that’s where my proposal comes in. Before the new structures get built, let’s dig a cut and cover subway underneath them. 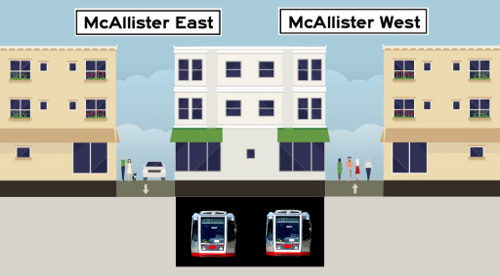 Personally my choice would be to build Muni Metro subways under a narrowed down South Van Ness and 19th Ave. to make up for Muni’s awful north/south service, and a new BART subway under a narrowed Geary Street. But those are just details. The important point here is this: this is a way to kill two birds with one stone. And although I like birds, narrow streets with new subways is a win/win in my book. We can get this right.